The biggest takeaway from New York Fashion Week spring-summer 2018 is vibrant colors are in. It’s not really surprising considering the drab state of world affairs right now that bold shades that make you want to smile, stand up & be seen were everywhere. The best part of it all is that you don’t have to wait six months to pull off this happy hues trend. You can make a sunny statement in these shades all winter long. Here are four spring colors to snag right now. 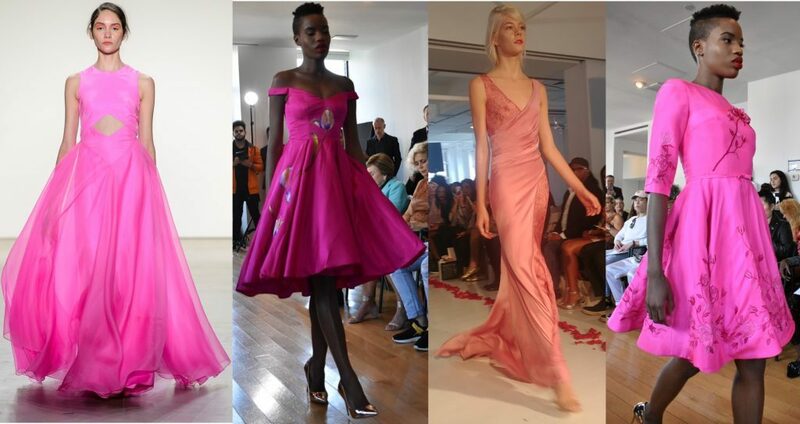 Be it millennial, dusty or hot – pink was one of the spring colors that showed up in a big way on the runways. The latest shades are a far cry from the princess powered pinks of your teen years. Slay these stunning shades when you want to own the room. Lemon-y looks stole the week but the Nancy Tran collection of the shade was my favorite. Delicate floral patterns complimented the bright hues making this one of the most fun spring colors to wear. Add a crop cardigan and tights and you’ll be bringing the cheer from now till spring.